For the BADASS bride who dares to have a rock n’ roll wedding you can incorporate your edgy style into your wedding plans and your attire. Leather Jacket A leather jacket over a wedding dress is the perfect combination of rock n’ roll and tradition. And a white one will maintain the traditional colors, while still expressing your edge. You can rock our “Nathalie” cropped lambskin leather MC jacket embellished with hand-made leather flowers & Swarovski crystals to complete your look. Sequin gown Instead of a traditional dress, you can opt for a shiny dress. Think 1940s glam. Even though Sequin is very in right now it is also classy and elegant and something that will never go out of style. It’s the type of material that is very flattering to many body shapes and figures and perfect for the bride on the move. You most never will see wrinkles and notice imperfections in sequin. You can do separate and have a long sequin skirt or high-low hem for added drama. If you opt out for a full sequin gown I recommend sleeves as a sleeveless top might get irritating when your arms rub on the dress. There is nothing more rock-and-roll that a little sparkle. Party in the front, long in the back Get a wedding dress like the one featured in Guns n Roses’ November Rain. Hell, watch that video in general for badass wedding ideas. Bright makeup & Wild hair Dye your hair neon pink or lilac for the occasion. And make it big! Even just a dark lip can take you from traditional to badass bride. Dark purple or bright red lipstick will make a bold statement. Tattoos Show your tattoos, pick a dress or an outfit where you can see them. After all they are pieces of art you wear every day and that are part of you. Why try to hide them on your most special day! 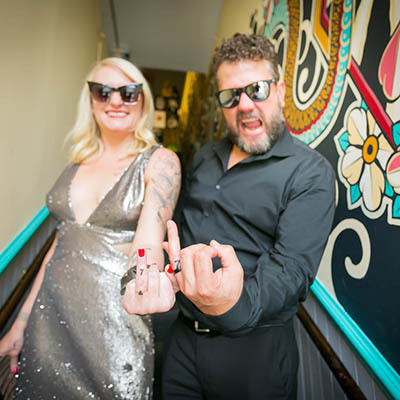 Some couples even tie the knot by getting matching tats on their wedding day..
Accessorize Have your traditional wedding dress but bring out the rock and roll fun with the styling. Sneakers or Boots Sneakers, cowboy boots or studded combat boots will add a rock n’ roll factor to any bride and groom’s outfits. This is a quick change for those of that want to keep it formal at the ceremony. Sunglasses & Studded bracelets Throwing on a pair of shades makes any attire a little hotter. Stack your arms with leather, studded and spiked bracelets. Elope Take a trip to Las Vegas and get married without all the flower arrangement and bridesmaids preparations! Book only a photographer to take pictures that you can later share with all your friends and family. It will be a magical experience without any of hassles that come with planning a wedding with 150 guests! And most important have fun and be yourself!